Answer: That is a great question to ask. The first reason is usually that in your environment there is nothing to indicate that something has gotten out of control. No internal alarm bell, no external pressure. Fifth, you might be so busy beating yourself up about all the things you are doing wrong, that you lack the mental space to even consider where to start. to tee up another offer for the next one in the series tomorrow! PS: Have you switched to plant-based protein shakes yet? 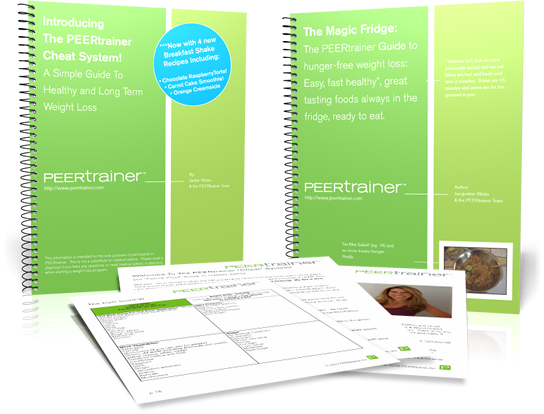 Get Your Copy Of The PEERtrainer Magic Fridge Recipe Guide, and A Bonus Copy Of The PEERtrainer Cheat System Absolutely FREE! When you enter your email in the form on THIS page, we will be sending you a free copy of “The Magic Fridge: PEERtrainer’s Guide To Hunger Free Weight Loss” which is a 50 page recipe guide that we normally sell for $10. You will also be sent a copy of the innovative PEERtrainer Cheat System, which is a healthy eating and weight loss plan that is literally impossible to fail on. We really hope you enjoy all of this, and we always look forward to hearing from you! Get Your Copy of the FREE Cheat System & Magic Fridge! The very notion, that "I allow myself" to gain weight, is misguided. It's like asking why "you allowed yourself" to develop kidney stones, or brain cancer or arthritis. It's the "facts," that cause us to gain weight, not what we "allow" ourselves to do. Your dietary habits, primarily established in childhood, are facts, either stronger than whatever re-conditioning you've received, about junk food eating, or smart food choices, etc., or they're not. The strength of a person's trained body image, is either sufficient to overcome their trained indifference about how fat they are, or it isn't. I don't decide to be indifferent about how I look. I "find myself" indifferent about how I look. The training I've received from the doctors that have advised me throughout my life, or ignored the importasnce of, nutritional issues and dietary matters, not what I've "allowed" myself to think about these matters, will determine what happens to my weight. Most doctors don't understand sound nutritional principles, so that if I've followed their advice for 30 or 40 years, my prospects of losing weight are not good. Overweight is a disease, not a choice. Most people fail in their efforts to achieve a healthful body weight, not because they're "lazy," or make "bad choices," but because all the circumstances that impinge on their ability to control their weight, favor weight gain. The progress in food "science," and the increasing number of doctors whose orthodoxies change, will make the difference. Changes and reversals in laws and customs, in the way junk food consumption is promoted by cynical and profit hungry food company executives, will save people from the dangers of overweight and obesity, not whether they "allow" themselves to get fat. Why Have I Allowed Myself to Gain this Much Weight? Because I live in a climate where winter lasts from November to April. Cold, cloudy, lots of snow and wind. My instinct is to stay inside and eat carbs. Every spring/summer I shed about 20 pounds. I start walking to work and back. Another reason I allow myself to gain weight is that I really love food and what it gives me. It comforts me if I feel lonely, soothes me if I feel overlooked at work, and lifts my mood if I feel impatient for retirement to finally arrive.